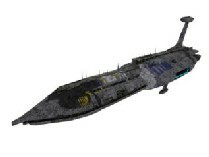 The main line Carrier-Destroyer of the Separtist fleet, the Providence is a formidable ship of war. Taking advantage of the unique properties of the Trade Federation war droids, the Providence can carry significant numbers of Vultures, Scarabs and Tridroids in both is voluminous hangers and perched throughout designated areas of the superstructure of the ship. Combined with strong shielding, a good anti-fighter battery and excellent torpedo coverage, it is no wonder that the Providence was chosen by General Greivous to be upgraded into his flaghsip the Invisible Hand. The Providence has a droid control ratiing of 10, allowing 60 fighters to be under the central computer's guidance at any one time. The hangar bays may carry droid fighter or the more traditional biologically piloted fighters, such as the Geonosian Nantex fighter or Techno Union fighter.